The U.S. Postal Service on Wednesday reported that it saw a $3.9 billion loss in fiscal 2018, a 44 percent larger dip into the red over the previous year despite a $1 billion revenue increase. Ongoing volume losses of 3.6 percent during the fiscal year, which ended Sept. 30, led to a “controllable loss” of $2 billion, more than doubling the loss from the previous year. Expenses outside of management’s control, such as funding for retiree health benefits, accounted for the rest of the negative outcome. The Postal Service declined to make required payments of nearly $7 billion to pay for future retirees’ pensions and health care. Fiscal 2017 marked the first time in five years that the Postal Service failed to turn a profit on controllable operations. While normal, first-class mail revenue dropped by $700 million, shipping and package income surged by more than 10 percent. Operating expenses ticked up by 3.1 percent, however, largely driven by increases in compensation and transportation costs. 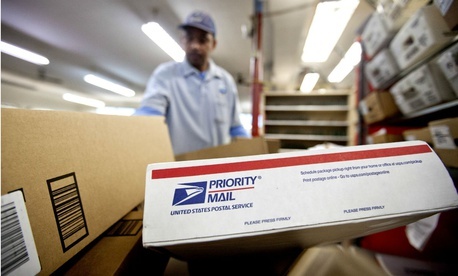 The Postal Regulatory Commission on Tuesday announced its approval of new postal rates for 2019, allowing USPS to increase the cost of a stamp by 5 cents and raise the cost of its offerings across the board by an average of 2.5 percent. Those changes, according to Chief Financial Officer Joe Corbett, would have added nearly $1.7 billion in revenue if they were in place during fiscal 2018. Corbett expressed some concern that growth in package and shipping business has slowed, while voicing satisfaction with the stability of marketing mail despite the declines in first-class and periodical volume. The Postal Service opted to pay down $1.8 billion of its $15 billion debt to the Treasury, and expects to make an additional $2.2 billion payment next year. Postmaster General Megan Brennan said absent changes, the Postal Service will continue to see losses at “an accelerating rate.” She reiterated her frequent calls for legislative reform from Congress and more flexibility in setting prices from the Postal Regulatory Commission. “Simply put, we cannot generate revenue or cut enough costs to pay our bills,” Brennan said, noting her “aggressive management” approach would not be sufficient to solve the agency’s problems. The Postal Service is gearing up for its busiest season, anticipating it will deliver 16 billion pieces of mail between Thanksgiving and Christmas. That is expected to include 900 million packages, a 5 percent increase over fiscal 2017. USPS is in the process of hiring seasonal workers to handle the surge.